Heacham House01485 579529work Guest AccommodationA warm and friendly welcome awaits you at Heacham House. Located in the quiet seaside village of Heacham, on the North-West Norfolk coast, situated midway between Burnham Market and King's Lynn; Heacham offers easy access by car or public transport to everything this beautiful part of Norfolk has to offer. Heacham is home to Norfolk Lavender and the RSPB sites at Snettisham and Titchwell, nature reserves at Holme, the Royal Sandringham Estate and golf courses at Hunstanton and Brancaster are all close by. Elegant and individually designed guest rooms; two king sized en-suites and one twin with a private bathroom. All are equipped with quality pocket sprung beds, luxury Egyptian cotton bedding, goose down pillows and soft fluffy white towels. Each room has a flat screen free-view television, extensive hospitality tray including filtered water and homemade biscuits and a range of quality toiletries. Your freshly cooked breakfast is served in the dining room at the front of the house overlooking the village pond. Enjoy fresh fruit Heacham House Granola, locally sourced rare breed free range bacon, sausages & black pudding; free range eggs and home baked bread. Delicious preserves are all homemade or alternatively try the local Norfolk honey. 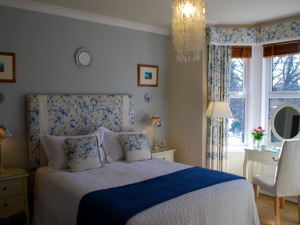 Heacham House limits bookings to 2 or more days. Good sized rooms, stylishly furnished with King sized beds, en-suites with power showers. Bedrooms overlook village pond. room 1 limits bookings to 2 or more days. Twin or super king bed(s) overlooking the garden with private bathroom across the landing Bathroom has full sized bath with shower over and under-floor heating. room 3 limits bookings to 2 or more days. A warm and friendly welcome awaits you at Heacham House. Located in the quiet seaside village of Heacham, on the North-West Norfolk coast, situated midway between Burnham Market and King's Lynn; Heacham offers easy access by car or public transport to everything this beautiful part of Norfolk has to offer. Cycle hire is available in the village. Fishing is available close by and golf can be arranged at local courses. Beach, pubs and shops all within walking distance of the property. GPS co-ordinates: Latitude 52.90717 Longitude 0.48786. By Car - From Kings Lynn take the A149 towards Hunstanton. At the end of the Snettisham by-pass take the first exit at the roundabout, towards Hunstanton and Heacham. After approximately 0.8 of a mile turn left into Lamsey Lane (signposted with brown signs to Heacham Beaches). Continue on this road which eventually becomes Staithe Road. As you pass the Duck warning triangle you will see the pond on the left with parking bays alongside the roadway. Park in the first available bays and you with find Heacham House opposite. If you enter the village via the Norfolk Lavender traffic lights follow Lynn Road passing Tesco Express on the left and the social club on the right. After passing a parade of shops, which include Boots the Chemists and Co-Op, take the first left into the one way street alongside the recreation ground, then at the crossroads turn left into Staithe Road. Park in the furthest parking bays alongside the duck pond. Heacham House can be found opposite. By Public Transport - There are fast trains into King's Lynn with Great Northern. Local buses to Heacham operated by Norfolk Green & Lynx can be caught from King's Lynn Bus Station or adjacent to the railway station. The bus numbers are Coasthopper 10 or 35 - ask to be set down in Poplar Avenue. Heacham House is a two minute walk from the bus stop - turn right at the nearest junction and we are found on the right side of the road. Note that not all Coasthopper services stop in the village some stop at Norfolk Lavender on the A149 a 15-20 minute walk from the house.